WordPress Page Duplicator duplicate selected page/post with find and replace functionality. Most of the time Word-press Users needs to create a page/post which is slightly different than existing page/post. 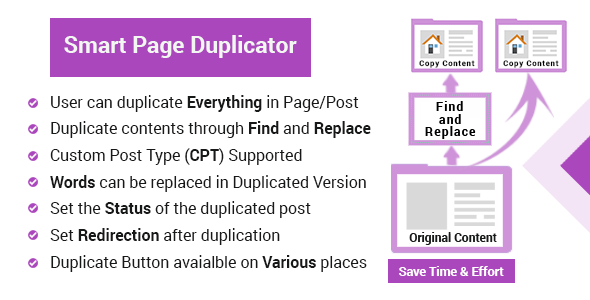 Instead of copying whole content and images which requires effort and time , WordPress Page Duplicator comes to rescue to duplicate page/post with just one click to save effort and time. WordPress Page Duplicator just not duplicate content BUT also provide options to change content during duplication. WordPress Page Duplicator also facilitate user to select which data of selected page/post you want to duplicate as well as which taxonomies and custom fields you want to duplicate.